UPDATE 11/2014: The Center has sold out of this incredible deal. I drop in to the East Bay Center for Creative Reuse here in Oakland’s Temescal District from time to time. It’s my favorite place to find treasures and creative inspirations. Today (August 20, 2014), I couldn’t believe my luck when I came across a stack of Scharffen Berger posters. These beautiful 24 x 36 inch (suitable-for-framing) posters featuring a graphic illustration of a Chocolate Melangeur were only a dollar. At that price, they won’t be there for long, so stop by and grab one while you can. Date posted: August 20, 2014. This entry was posted in Featured, Local chocolate, Miscellaneous chocolate information. Bookmark the permalink. I have one left. Email us (via Contact Us below) if you are interested. In the bottom right corner is the name Hullinger. Hi – Is there any chance the artist’s name is listed on the poster? We got some to give as gifts, but I would be happy to sell you one. Email us (use the Contact Us link below) if you are still interested. Any chance you’ve come across more of these or know someone who would sell one? 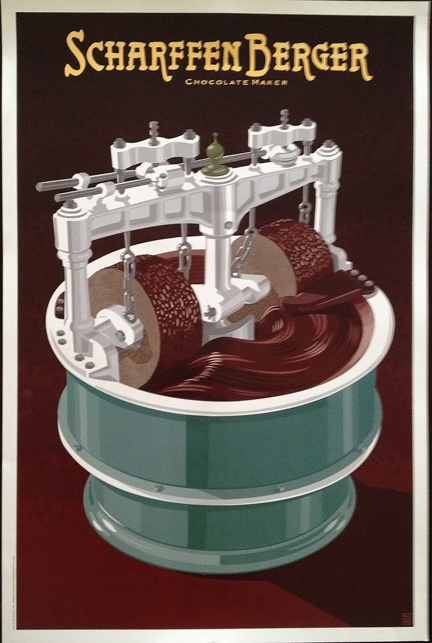 I have a matching poster from a factory tour & would love to make it a set for our kitchen. I called a while ago to see if any were left but no luck. Thanks! Ronnie & I bought one of these beautiful posters to hang in our house. Framing this in a simple wooden frame and plexiglas (we live in earthquake country) cost over $300. So a $1 poster ended up being quite the investment!